Today we are super excited to announce a new product in our family: Maître Viral Lead Magnet. What is a Viral Lead Magnet? If you are a marketer or simply have spent enough time online you probably bumped into a lead magnet many times. When you have left your email address on a website for a white paper or a free ebook, that’s a lead magnet. The transaction is simple: you get the freebie, the website gets your email. Kieran and I have spent a considerable amount of time brainstorming how we could turn this one-off transaction into an automated lead generation machine. The answer is the Viral Lead Magnet. You create your enticing 1st reward. A ‘gift’ / ‘incentive’, to convince people to give you their email address. It could be a free ebook, exclusive access, white paper, it’s all up to you. Maître will then send them an email when they sign-up, you have complete control over the email content. The 1st reward is just the first step. What makes Viral Lead Magnets really powerful are the “bonuses”. Bonuses are rewards that your sign ups can unlock by referring their friends. 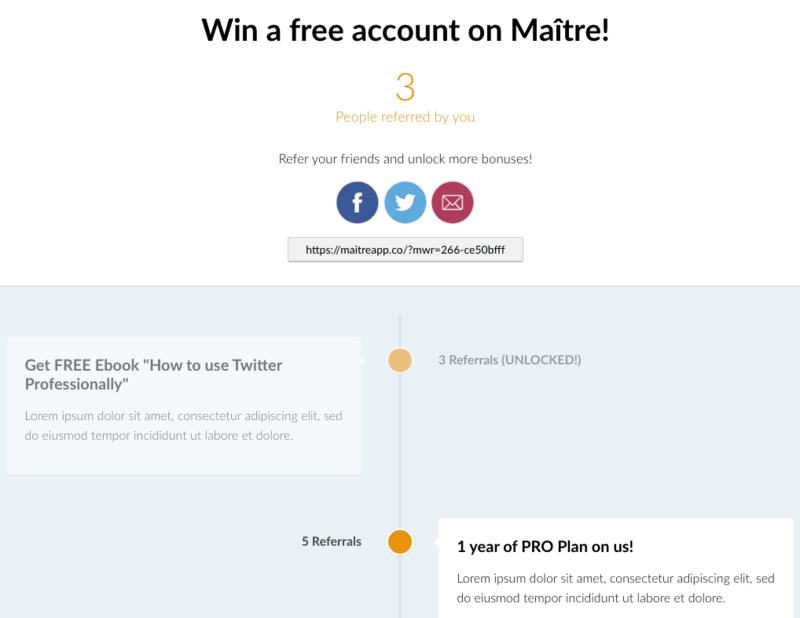 (eg: Refer 3 friends and get another free ebook; Refer 5 friends and get a free PRO account). The bonus rewards are 100% decided by you and you can make it anything you like, and any number of referrals. When your sign-ups unlock a bonus, we send them an automated email that you can customize, in other words, this is where you give people the bonus. The more friends they refer, the more bonuses they unlock, creating a viral lead generation machine. We like to think of it as a traditional Lead Magnet on steroids. We turned a simple, one-off lead magnet into something that is driven by viral mechanics, where you subscribers generate an ever increasing number of leads for you. And as with any Maître tool it doesn’t require any coding. We have made the user experience as simple as possible. What’s the difference with Waiting Lists & Sweepstakes? This is a fair question. Our family of products now includes Waiting Lists, Sweepstakes and Lead Magnets. Some clarity is needed. Broadly speaking Waiting Lists are geared towards launches and building hype for new products. Waiting Lists are based on competition: people compete with each other to climb to the top of the leaderboard. If you have an existing engaged community and an exclusive reward to offer, this product can do wonders. We have seen campaigns generating thousands of leads in a couple of weeks. Viral Sweepstakes are more suited for regular contests (eg: weekly or monthly). People are still competing with each other to increase their chances of being drawn, but the competition is more subtle. Sweepstakes feel more like a game, where winning is determined by referrals AND luck. They are perfect to keep your customers/community engaged with regular contests. Lead Magnets can be used by any company that wants to generate more leads. People don’t compete with others, but the experience is nevertheless designed to be highly engaging, gamified and motivating. With the right bonuses, you can achieve massive growth in a very short period of time. Also Lead Magnets don’t “expire” and can be used virtually forever. We believe Lead Magnets are a huge leap forward towards this goal. As I wrote 9 months ago, we are evolving into a platform of tools to generate growth and leads. These are really exciting times. We have made the decision to embrace transparency with our strategy and even our financial metrics. It’s really exciting to build a company publicly with the support of a great community. I’m seriously looking forward to meeting and helping out ambitious entrepreneurs. Sign up for an account today. And if you have any questions, please reach out!